My first stop was the blind at Frank Lake, east of High River. There were many American Coots, Fulica americana, calling to each other in the reeds. This is one of a few that came into clear view. A Horned Grebe, Podiceps auritus, was diving for food in front of the blind, along with many ducks including Common Goldeneye, Lesser Scaup, Mallard, Canvasback, and more. As I walked away from Frank Lake, this family of Trumpeter Swans, Cygnus buccinator, were also continuing their northward journey. Heading north and east from Frank Lake the prairie is dotted with little marshes and sloughs. Some were still frozen but, with no discernible pattern, others were completely open and each one had its own little birding treasures such as these Northern Pintail, Anas acuta, surely the most dapper of ducks. 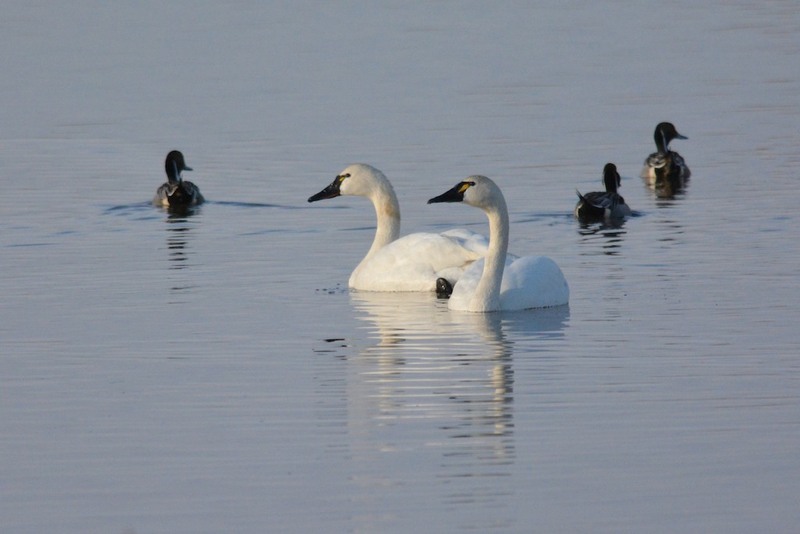 It was in these prairie potholes that I completed my set of swans for the day with this pair of Tundra Swans, Cygnus columbianus. Just north of Blackie I drove into a wall of fog and snow as the forecast storm arrived - welcome to April, Calgarians! 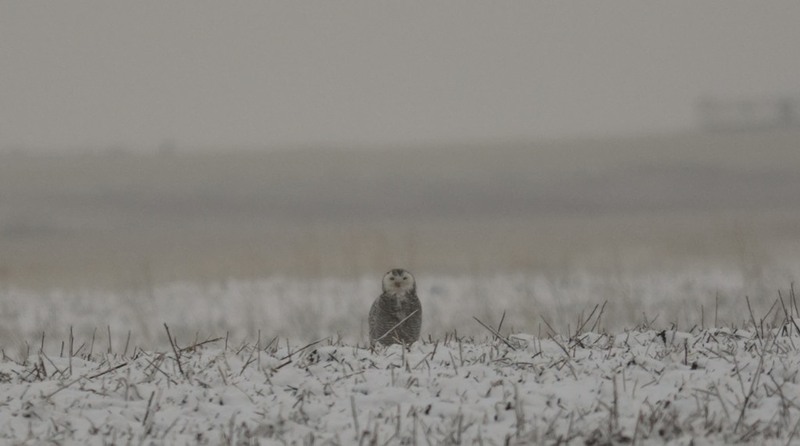 Pushing on to my next destination, Namaka Lake, this young Snowy Owl, Bubo scandiacus, sat forlorn in the middle of a field opposite the lake. I'm used to seeing these owls on poles but this bird sat for the whole time I was there - I hope it is not "out of gas" on its return journey north. 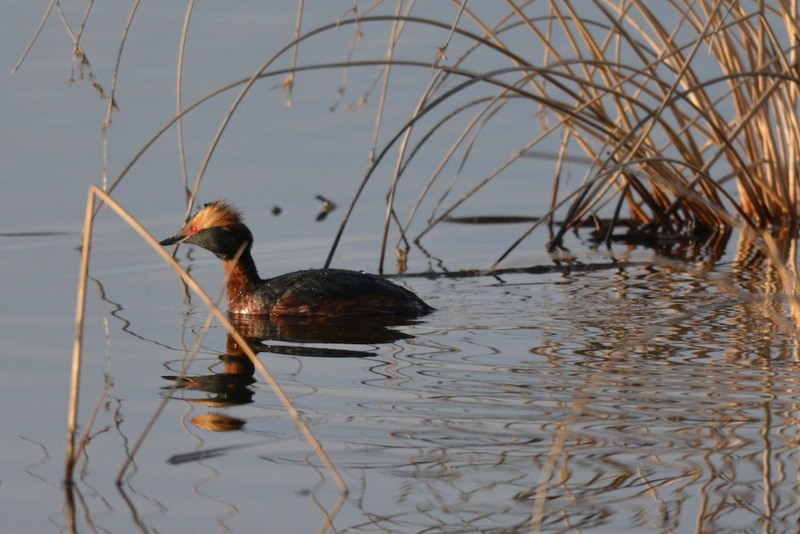 The main body of Namaka Lake was completely frozen over but the south wetland was open and filled with ducks. 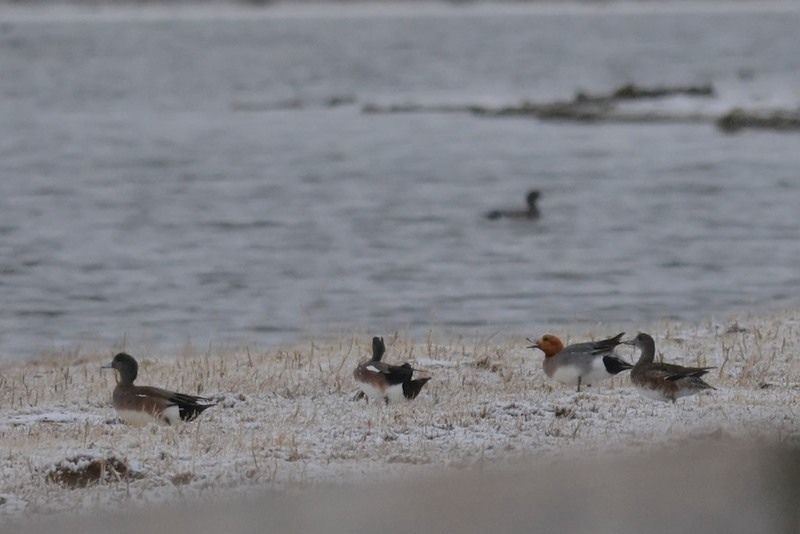 Standing on the shore were these four Wigeon and the second from the right is a male Eurasian Wigeon, Anas penelope, the last of Alberta's 33 regularly occuring species of waterfowl for me to find! 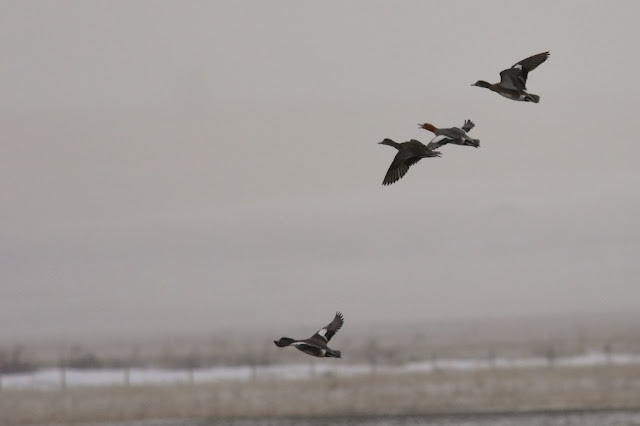 As you can see in this image, the bird was aggressively chasing the two male American Wigeon, away from the female at right. What's odd about this is that the female appears to be an American Wigeon as well. When these same four birds flew off for a few laps of the lake, the female continued, to paraphrase Tammy Wynette, to "Stand By Your Interspecific Hybridizing Man". Of course it could just be that I'm wrong about the ID on the female but after some reading it really seems like an American to me - more on Wigeon ID in a pdf article from the ABA magazine if you're so inclined. All in all a lovely day out on the prairie, in spite of the weather. 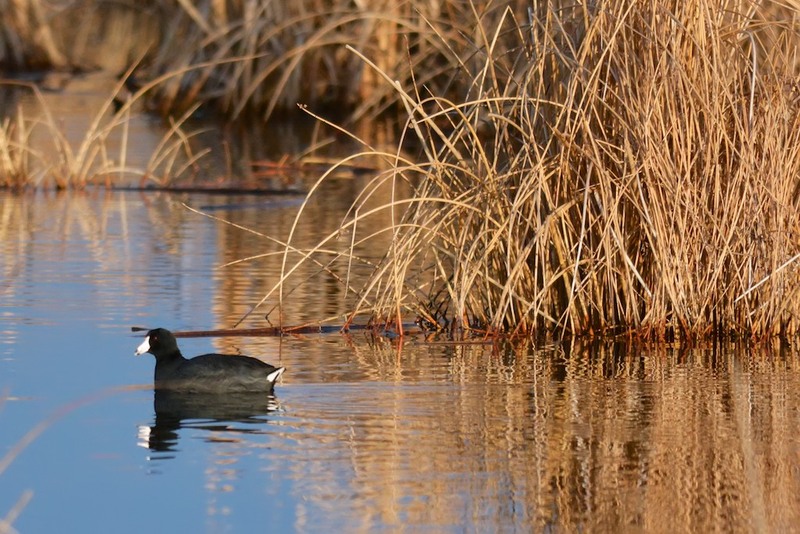 I'm looking forward to my next wetland outing on the 21st, this time to Ralph Klein Park. Eurasian Wigeons are such neat ducks! Congratulations on the sighting, and I hope you have a good time on the 21st. Exciting Changes to the Blog! All text and images copyright. Picture Window theme. Powered by Blogger.